One Republican member of Congress, defending the GOP health care plan—the American Health Care Act (AHCA)—suggested that concerns that the loss of health care coverage leads to death are overblown. However, the scientific literature on the effects of insurance coverage on mortality shows that the coverage losses from the AHCA would result in tens of thousands of deaths. The secret Senate bill was finally released today, and it is broadly similar to what passed in the House: It ends Medicaid expansion and makes further deep cuts to the program; eliminates the individual mandate; and reduces funding that helps low-income Americans afford health coverage. The Congressional Budget Office (CBO) has not yet released its score of the Senate bill, although it is expected to do so early next week. The CBO, however, has released a score of the House’s version of the AHCA, which is largely similar to the Senate bill. The score projected that, by 2026, 23 million more Americans would be uninsured under the House bill compared to the Affordable Care Act (ACA). Using estimates of mortality rates from Massachusetts’ experience with health reform, we estimate the number of additional deaths resulting from coverage losses from the Senate bill under three scenarios: one scenario in which coverage losses from the Senate bill are the same as under the House version, and two scenarios in which those coverage losses are modestly reduced by changes from the House bill. Assuming that 15 million fewer people would have coverage in 2026, we estimate that the coverage losses from the Senate bill would result in 18,100 additional deaths in 2026. Assuming that 19 million fewer people would have coverage, we estimate that the coverage losses from the Senate bill would result in 22,900 additional deaths in 2026. Assuming that 23 million fewer people would have coverage, we estimate that the coverage losses from the Senate bill would result in 27,700 additional deaths in 2026. If coverage losses from the Senate bill matched those from the House bill, it would result in 217,000 additional deaths over the next decade. Allocating these coverage losses among the states, this analysis also presents estimates of additional deaths by state. A significant body of research has demonstrated the health benefits associated with health insurance expansion, including reducing the rate of death among the population. One study found that state Medicaid expansions that preceded the ACA were associated with a significant reduction in mortality. A recent analysis of these pre-ACA Medicaid expansions demonstrated a 6 percent decline in all-cause mortality due to Medicaid expansion. Another analysis showed that following implementation of the ACA’s provision that allows young adults to remain on a parent’s health insurance until age 26, mortality rates decreased among Americans ages 19 to 25. In particular, mortality caused by diseases amenable to health care dropped among young adults, while trauma-related mortality did not. And a study of patients with cancer between the ages of 20 to 40 found a statistically significant association between insurance coverage and reduced mortality from any cause. The result most relevant to the ACA and its repeal comes from a study examining the effects of the Massachusetts health care reform on all-cause mortality and on mortality due to causes amenable to health care. The study found that expanding insurance coverage was associated with a 2.9 percent decrease in all-cause mortality and a 4.5 percent reduction in deaths from causes amenable to health care. Because Massachusetts’s reform was used as the model for the ACA and included a coverage mandate, Medicaid expansion, and private insurance expansion through the individual market, the data is more representative of the effects of ACA insurance gains than studies looking solely at Medicaid expansion or narrow demographic groups. Furthermore, observers have noted that the study’s quasi-experimental study design is of high quality and the “next best thing” to a randomized control study. Other parts of the scientific literature have shown how having health insurance, unsurprisingly, results in better health. A recent study of three years of ACA data demonstrated that uninsured people who gained coverage through the ACA experienced a 23 percent increase in self-reported “excellent” health. One analysis found that the ACA coverage expansion was associated with reductions in self-reported “fair” or “poor” health and days with activity limitations due to ill health. Another analysis showed that ACA insurance gains were associated with an increased share of respondents reporting excellent health. And a recent study of ACA-facilitated Medicaid expansions found that they modestly improved self-reported health. Other insurance expansions produced similar results. Massachusetts’ insurance expansion was associated with improvements in self-reported general, physical, and mental health. Data from the Oregon Health Insurance Experiment showed that expanding Medicaid was associated with improved self-reported physical and mental health and reduced depression. Insurance coverage also improves children’s health and access to care. Research shows that when parents have insurance coverage, their children are more likely to be covered, maintain stable coverage, and receive needed care. According to the Institute of Medicine’s systematic review, insured children are more likely to gain access to well-child care and immunizations, appropriate care for asthma, and basic dental services, as well as have fewer avoidable hospitalizations, improved asthma outcomes, and fewer missed days of school. Taken as a whole, the research strongly suggests that health coverage has a significant positive effect on health. However, a few studies have found more limited health impacts of insurance expansion. While the Oregon study found improvements in self-reported health, it did not detect clinical improvements other than depression reduction. Another study showed no changes in self-reported health resulting from the ACA, although a subgroup analysis did show improved self-assessed health among older nonelderly adults, especially in expansion states. And an early observational study of the ACA’s Medicaid expansion comparing low-income adults in expansion and nonexpansion states found no differences in self-reported health between the groups. There may be several reasons for these outlier results. The studies in question looked at time frames too short or sample sizes too small to capture more significant health impacts. In addition, insurance is a necessary but not sufficient factor to receive quality health care. Receiving high-quality health care requires access to providers, institutions, and services; access to consistent primary care and referral services; choice of providers and institutions; and the delivery of high-quality services. It also requires that insurance policies cover basic and vital services. Drawing on the Massachusetts experience, we estimate that there would be one excess death for every 830 people who lose coverage as a result of the AHCA. 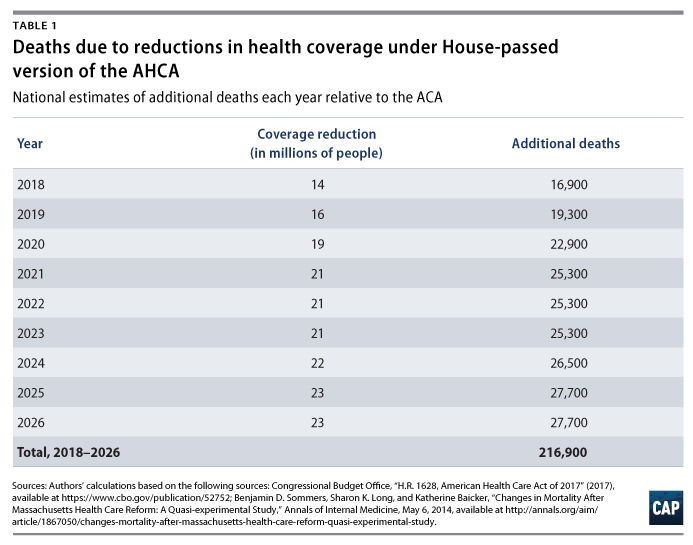 The CBO projections of coverage reductions under the House version of the AHCA would equate to 217,000 additional deaths over the next decade, including 27,700 additional deaths in 2026. (see Table 1) To put this in perspective, that is approximately the number of people in the United States who died from opioid overdoses in 2014 and about twice the number of deaths by homicide that same year. We also estimate the additional deaths in 2026 resulting from coverage losses from the Senate bill under three scenarios: one assuming coverage losses equivalent to the House bill and two scenarios that show modest reductions in coverage losses. If the Senate bill results in coverage losses of 19 million that would result in 22,900 additional deaths in 2026. 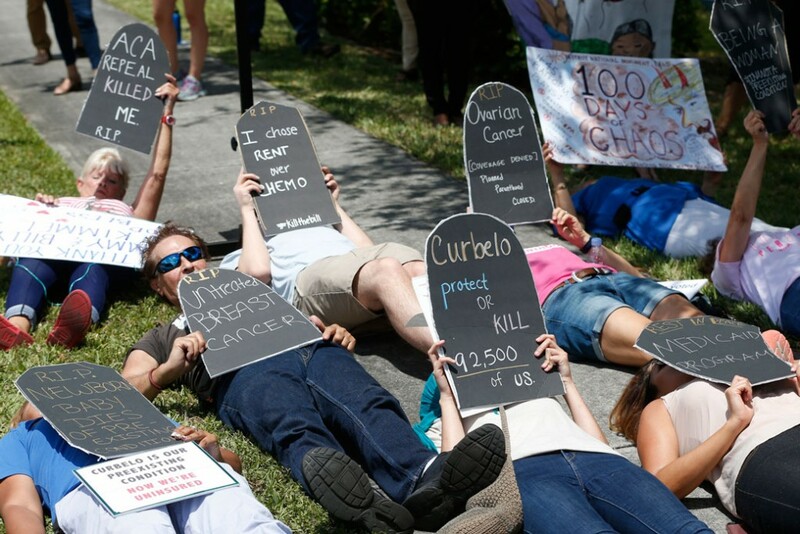 If the Senate bill results in coverage losses of 15 million that would result in 18,100 additional deaths in 2026. In addition, drawing on the Center for American Progress’ estimate of state-level coverage reductions in 2026 under the House version of the AHCA, we estimate additional deaths by state in 2026 as a result of coverage losses from the Senate bill under the three scenarios. Under the scenario assuming coverage losses of 23 million, annual additional deaths would range from 36 in North Dakota to 3,111 in California in 2026. Under the scenario assuming coverage losses of 19 million, annual additional deaths in 2026 would range from 30 in North Dakota to 2,570 in California. Finally, under the scenario assuming coverage losses of 15 million, annual additional deaths in 2026 would range from 24 in North Dakota to 2,029 in California. Given the overwhelming weight of evidence, there should be no debate: Health care coverage has an impact on whether Americans live or die. Our data estimates show that under any of the scenarios we analyzed, a significant number of American lives are at stake in this debate. Legislators considering whether to support this bill should keep in mind and soberly consider the catastrophic effect the AHCA would have on so many Americans and their families. We calculated national excess deaths per year by dividing the estimated coverage losses by the estimated numbers needed to treat (NNT) to prevent one death, based on analyses of the Massachusetts health care reform. “Treatment” in this instance refers to the number of individuals who would need to receive insurance coverage in order to prevent one extra death. The Massachusetts study found that there was one fewer death for every 830 people who gained coverage; that NNT was consistent with a 30 percent relative reduction in individual-level mortality for persons gaining insurance. We estimate that there would be one excess death for every 830 people who lose insurance coverage, which assumes that the Massachusetts result would be symmetric for health insurance gains and losses. Of note, our approach is similar to that taken by the White House Council of Economic Advisers to calculate the mortality reductions from the ACA. Our estimate of the national number of excess deaths each year under the AHCA is then equal to the CBO-projected coverage reduction under the House bill divided by 830. We calculated state level estimates by applying the same methodology to state-level health insurance losses from the Center for American Progress’ state-level analysis, which combines data from the CBO, the Kaiser Family Foundation, the Centers for Medicare and Medicaid Services, and the American Community Survey to calculate anticipated insurance losses by coverage type. We also included estimates of the number of excess deaths in 2026 if national coverage losses under the Senate bill were 15 million or 19 million that year. For our state-level estimates, we assume that each state’s coverage reductions and excess deaths are 65 percent and 83 percent of our estimates of the effects under the House-passed bill, respectively. Recent debate sheds light on different approaches to estimate the mortality impacts of insurance loss. Bearing this debate in mind, we designed our approach using the most accurate, rigorous studies. We base our calculations on estimates of AHCA-related coverage losses from the CBO and the Center for American Progress, and on Benjamin D. Sommers, Sharon K. Long, and Katherine Baicker’s 2014 quasi-experimental study of the effects of Massachusetts Health Care Reform on mortality. We chose this study due to its sample size and power, and because Massachusetts’ health reform, which expanded both private and public coverage, was used as the model for the ACA. One limitation of our analysis is that the same NNT was applied to all states, although the estimate was derived from the Massachusetts’ health care reform. There are demographic and health care infrastructure differences between Massachusetts and other states. The Massachusetts population has a higher per capita physician rate, lower baseline mortality rate, higher income and baseline insurance coverage rates, fewer racial and ethnic minorities, and more women, compared to national averages. Some of these factors suggest that Massachusetts may have a higher NNT than other states, meaning that our estimate of the number of excess deaths under the AHCA would be too low, while other factors suggest the state may have a lower NNT. In addition, the NNT was calculated from mortality decreases associated with insurance expansion. There is uncertainty as to whether withdrawing insurance will cause the equal and opposite effect of providing insurance. Lastly, our estimates capture only the impact of increased uninsurance under the AHCA and do not take in to account possible mortality effects among people who would remain insured but lose certain benefits or encounter worse access to care due to the bill. We calculated a 95 percent confidence interval around our estimates of excess mortality. The confidence interval contains the range of reasonable values that include our estimate of excess mortality, with 95 percent confidence. Within this range the best estimate for the actual number of excess deaths is the point estimate. The point estimate is the mean and represents our best prediction for annual excess mortality rates, given the current evidence and available data. For instance, in the year 2026 and assuming 23 million more people are uninsured, we estimate that 27,711 excess deaths will occur, and we are 95 percent confident that the true number of annual excess deaths will be between 9,583 and 46,000. Ann Crawford-Roberts is a medical student at the Icahn School of Medicine at Mount Sinai and a graduate of the Harvard T.H. Chan School of Public Health. Nichole Roxas is a medical student at the University of Rochester School of Medicine and Dentistry and a graduate of the Harvard T.H. Chan School of Public Health. Ichiro Kawachi is a professor of social epidemiology and the chair of the Department of Social and Behavioral Sciences at Harvard T.H. Chan School of Public Health. Sam Berger is the senior policy adviser at the Center for American Progress. Emily Gee is the health economist for the Health Policy team at the Center.